The midterms are over, and the dust kicked up by the first national election of the post-Citizens United era is gradually settling. 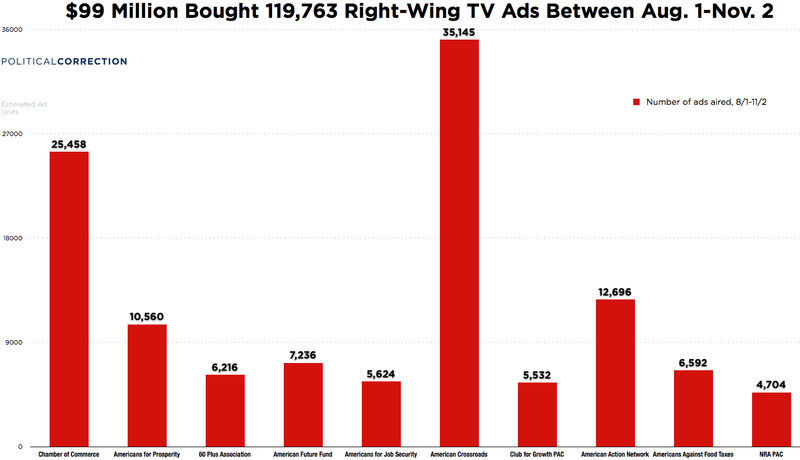 Right-wing TV ads from outside groups did an awful lot of that dust-kicking. 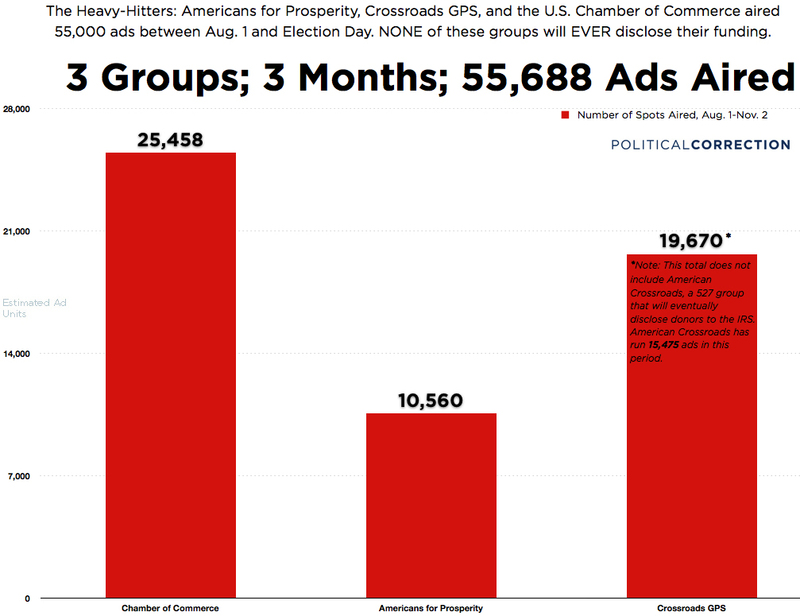 According to ad data reviewed by Political Correction, there were twenty separate right-wing groups outside the official party structure that managed to air over 1,000 ads each. These twenty groups together accounted for 144,182 TV ads, over 92 percent of the total pro-Republican TV ads aired by outside groups from August 1 to Election Day. At 30 seconds per ad, that's 50 days of television in the last 90 days before a major election. These three groups obviously thrived on anonymity, along with dozens of other groups on the right who pumped undisclosed millions onto the airwaves around the country for months. As our ad check items demonstrate, most of these ads warp, withhold or misrepresent the truth. Again, 77 percent of the ads run by the 1,000+ big-timers on the right this season were paid for with undisclosed funds. That concerns a great many people, as an NBC/Wall Street Journal poll found in October. Yet there are arguments out there to the contrary. An item last month in the libertarian tribune Reason argued that we should not fear anonymous political speech by likening the Rovian TV ads of today to the critically important — and pseudonymously authored — Federalist Papers that carried the grand arguments of the Founding out of aristocratic meetings and into broadsheets around the young country. Anonymous speech is fully in the American grain but it also comes at a price. When the source of political speech is not known or disclosed, voters tend to discount it, or at least look for corroboration elsewhere. Which is exactly how it should be. And if you don't in the end trust voters to make informed decisions, then all the mandatory disclosure in the world can't help them. That's a lovely idea. Now show me the working-class voters who have time to "look for corroboration elsewhere" in a society where anonymous money buys well over 35 days of TV time in a 90-day span. Sure, the minority of Americans who have leisure time can double-check what they see on TV. But most of America is simply getting priced out of the information market for political decision making. By flooding the zone, outside anonymous-money groups make it much, much harder (if not impossible) for average folks to know the score when they head to the voting booth. The political theory behind resistance to campaign finance reform and disclosure rules may be sound. But the data suggest the market for political information is broken. Voters aren't stupid. Misinformation and negativity are not new tactics (as Reason has pointed out). But denying voters a chance to evaluate the interests behind a given piece of information or negativity is a terrible idea in a democracy. Especially one where business interests and the public interest do not necessarily line up. Reasonable, intelligent people can probably come up with a system for financing our electoral process that addresses the fear of persecution Reason and the Supreme Court have spelled out, as well as voters' reasonable fears of a government "beholden" to anonymous wealthy interests. Those interests have given us well over 100,000 reasons to come together on the subject.